UPDATE 1: We included the official press release below (1/31). Kia Philippines is ending 2015 with a big surprise (literally): the launch of the 11-seater version of the Grand Carnival. 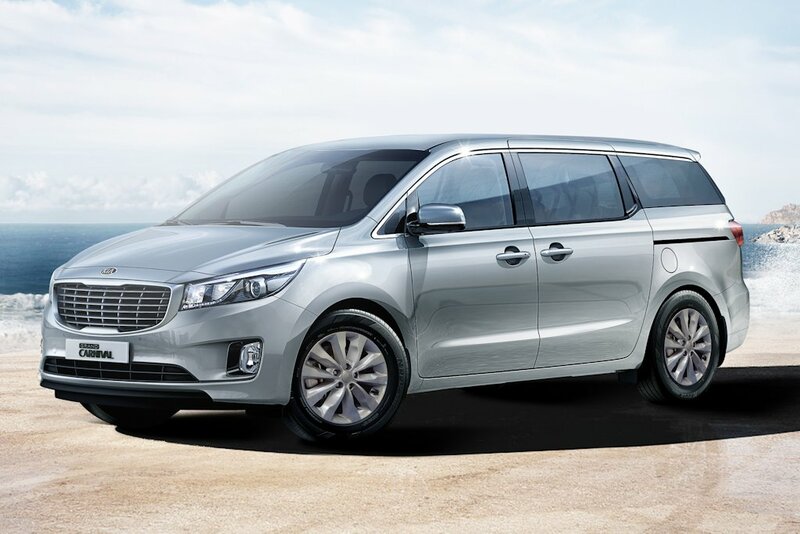 Dubbed the Grand Carnival 11, this version of Kia’s large MPV offering is catered towards larger families (who don’t find the second-row Captain’s Seats useful) or those who’re looking to maximize the Grand Carnival’s cavernous interior. At the same time, the Grand Carnival 11 starts at a much more pocket-friendly price. The Kia Grand Carnival 11 starts at P 1,575,000 putting it squarely against the Hyundai Starex and Toyota Hiace Grandia. Of course, it carries less opulence than the fully loaded 7-seater Grand Carnival. You lose things like the 18-inch alloy wheels, leather seats, and the moon roof. Still, it’s reasonably loaded with anti-stain YES Essentials fabric seats, power side doors, and even a rear back-up camera. Furthermore, unlike the Starex and Hiace Grandia, the fourth row seats in the Grand Carnival can be stowed flat into the floor with a single action mechanical lever. Like the luxury-oriented Grand Carnival, the Grand Carnival 11 is powered by the R 2.2-liter 4-cylinder CRDi engine with 200 horsepower and 431 Nm of torque. The sole transmission remains a 6-speed automatic minus the cruise control function. This introductory price is only good until December 31 and valid with a minimum reservation fee of P 100,000. Managing a smile while sitting in traffic is made possible through the latest offering from Kia’s stable of stylish and class-leading vehicles, the all-new 11-seater Kia Grand Carnival. For the driver, a posh and high-tech cockpit makes for an effortless and enjoyable ride. The wide, center console features a 3.5” OLED-type display, a cutting-edge multimedia system, and other key driver controls for light, active eco system, and engine, among others. Standard, Hydraulic Type (HPS), and Tilt and Telescopic Adjust-type of power steering ensures steady handles and reliable drives when road conditions are more challenging. Housed in its modern, Euro-inspired exterior is a spacious cabin with elegant finishes and flexible seating and carrying options. 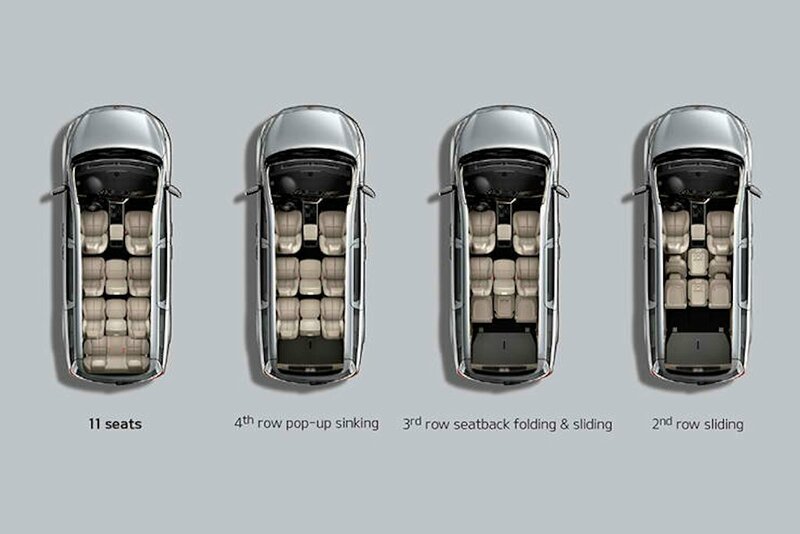 Second and third row seats can be rearranged with ease, giving ample space for different sizes and shapes of cargo or for additional passengers. An added practical feature is the stainless technology cloth used for the seat material. Liquid spills bead up, and can easily be wiped away while hard stains that have been rubbed or pressed can be removed with soap and water without difficulty. Kia Grand Carnival is indeed a well thought-out masterpiece on the road. Even power side doors are installed so that a flick of a switch is all it takes to get in and out of the car with total ease. Under the hood, the R 2.2L in-line 4-cylinder, CRDi, DOHC, and 16V engine delivers efficiency and optimum strength. The all-new Grand Carnival is a testament of refined balance of power and handling, giving both driver and passenger a complete sense of convenience and comfort every time. The Korean auto-giant definitely reinvented the concept of family cars and outfitted the Grand Carnival with projector headlamps, halogen fog lamps, and a glossy black with white chrome bar radiator grille for that urban look and feel. Its polished silhouette and cab-forward design project a kind of style that turns heads and leaves lasting impressions. Now, a modern-day family van is ready to take the road in style! 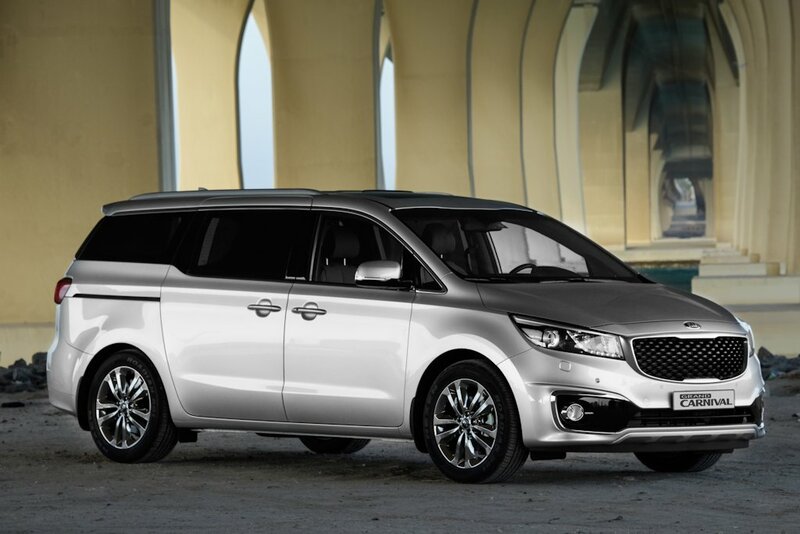 Experience utmost luxury, security, and relaxation with the all-new Kia Grand Carnival. I really want to like this. I really do. It has the right price, good styling, a powerful diesel engine and can seat a lot. The problem is I'm still not sure about the reliability because its a Korean car. We had a 2003 hyundai grace van it never had any major mechanical problems while it was still with us sold it last year (2015). even though it was stored and not used for almost 3 years (June 2013- Dec 2015) we were surprised that it still runs just replaced the oil and battery and it was good to go. I have owned 6 Korean cars before... 2 hyundai Starex. 2 kia sorento's... 1 hyundai tucson and 1 hyundai Sonata... the problem is not the reliability.. Korean crdi engines and gasoline engines have been at par with the Japanese .. even better in some instances.. the problem is the re sale value of the Korean cars. Expensive? Good luck finding another modern car that can seat 11 people and has a decent engine at 1.5M. I think that the P1,575,000 price is reasonable and represents a good value. I reserved one for myself and a second one for another family member. The P1,575,000 price for a well-rounded economical but powerful minivan that can seat 8 comfortably (11 is tight) is a good value proposition. After-sales service and parts availability is also a concern aside from quality. Maintenance should also be considered in cost of ownership. Good luck! Ang napapansin ko lang naman na problema ng korean vehicles lalong lalo na dun sa mga vans or people mover vehicles ay yung brakes nila, madaling masira. I hope ulysses or someone could give us more details about this vehicle na hinde nakasulat/makikita sa kanilang website. yung specs sheet at brochure kasi sa kia website ay parang kulang. more on dimensions lang makikita. Great price! I'm interested. This is better speced than the overpriced and under powered Starex TDCI 12 seater MT. HARI should learn from this. Uly, any idea on its regular price? 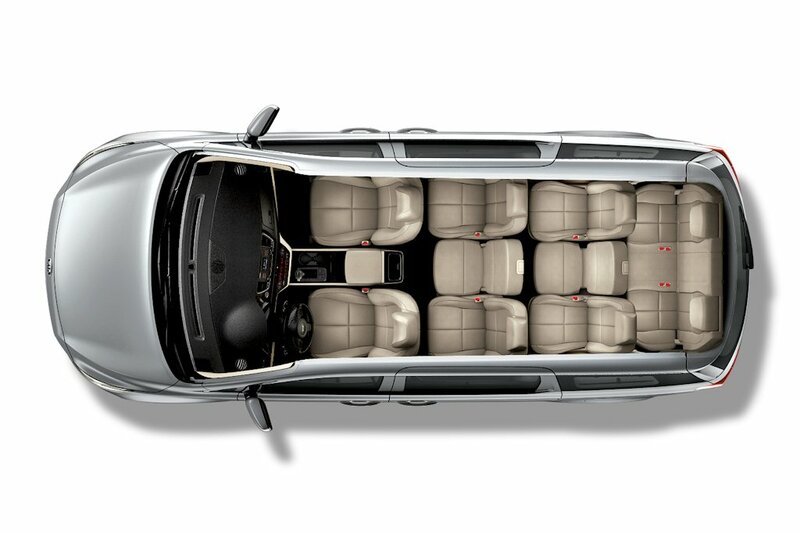 After the 4th row is folded into the floor, the 2nd and 3rd row seats can be moved back to create a more usable and spacious 8-seater minivan instead of the legroom constructed 11-seater. Kia's after-sales service, as well as parts availability, are a bit of a drag specially for buyers outside NCR. One should also consider the vehicle's maintenance (during warranty period) as part of the cost of ownership. When you cram 11 people in a vehicle, coupled with the road and traffic condition in PH, the vehicle will surely be subjected to a lot of wear and tear early. I live in Quezon City and my experience has been very positive with the two Kia Sorento (one purchased in 2013 and another in 2015). As to the cost of maintenance, this would be directly proportional to the use of the vehicle so the more you use a vehicle, it is but to be expected that the higher the maintenance cost. There is no vehicle that I know of where the rule would be different. Realistically, I would consider this as an 8-seater rather than an 11-seater. 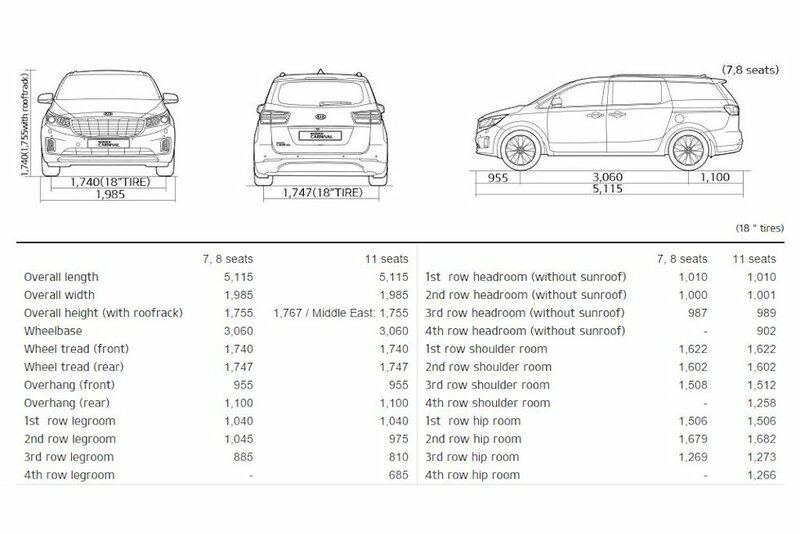 The 11-seater configuration will likely work with kids or in a pinch with adults, for short distance travel only as legroom will be tight and cramp. I had the same experience with a much earlier generation Hyundai H100 Minivan. But Hyundai and Kia has improved considerably since then. This is most evident in the new generation vehicles such as this Grand Carnival. Kia is 2nd only to Porshe in terms of the most improved brand in 2015, beating out all the other brands and marques such as the Audi, BMW, MB, VW, Toyota, Nissan, Mitsubuishi, Renault, Peugot, Fiat, etc. I hope Kia Ph extends the reservation promo for the special price. I agree that this is a true 8 seater mini van with enough room for luggages at the back. Kia good quality! Filipino jeepneys crap! Cant even manufacture decent car. I reserved for kia carnival last april 2017. Its price is 1,725,000. No stocks then after 1 week, the price goes up to 1,799,000. No available unit.at present, still no available unit, its only 3 days after my bank approved it, now it priced at 2,095,000. Is this right?